Eight guests cAn be accommodated across four staterooms, three of which are en suite, and an optional aft crew cabin can also be specified if required. With a wide beAm, three generous on deck living areas, sportbridge and tender garage capable of storing a 3.3m RIB, the S65 combines distinctive styling and high performance with expansive entertaining options and beautifully appointed guest accommodation. 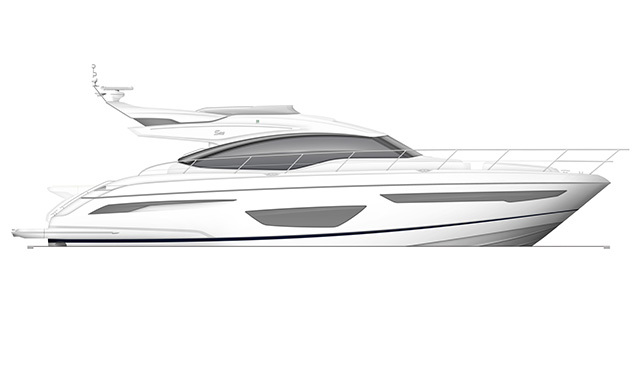 With a top speed of up to 36 knots and efficient cruising at 30 plus knots, the S65 represents the latest in advanced hull design that incorporates not only outstanding sea-keeping but superior efficiency across a very wide range of cruising speeds.